For our example, we want to display all of the data from our 'Breakfast' sheet from our 'Menu Example' source. Our configuration settings would look like the image below. 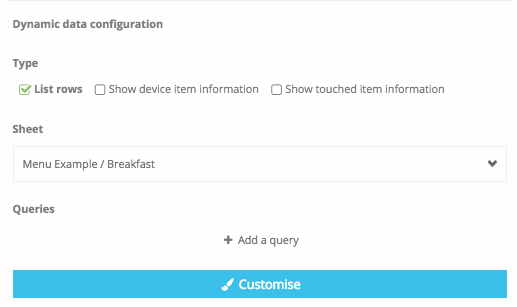 Click 'Customise' to be taken to the settings where you can format the data you have configured to show. These settings are split into three main areas, format how your data shows, select which data you want to show, format how that data looks. Order - You can select the order your data is shown by changing the 'Order by' and 'Order' options. To display your data in the order it is shown in your excel file then order by UI order in an ascending order. Row settings - The 'Row height' sets the height of each row which the data will be displayed within. The 'Row alignment' will align the data to the option selected. Background settings - Choose colour for the 'Row, Row active, Field, Field active' backgrounds and the 'Field active text' colour. You can select which data is displayed by selecting 'Fields'. As you may notice, each 'Field' is a column header from your source, with your custom columns (if added). 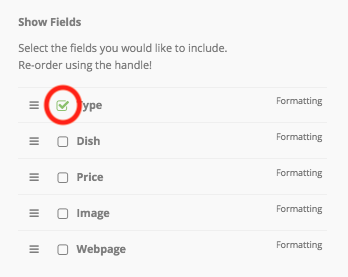 Add a field - Choose to display a fields data by clicking the box to the left of the field name to display a green tick. Remove a field - Click the green tick to display the empty box again. Formatting of a field - Click the field name so it displays in a green colour. This will also display a dotted area around the data which you can resize and move within the rows height and zones width. You need to make sure all of the data is within this dotted area otherwise it wont show. The max height is determined by the rows height you previously set. 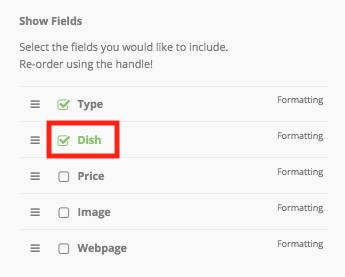 Reorder fields - You can reorder fields if you want specific data to be shown 'above' or 'below' others. The field at the top of the list will be 'on top' of all of the selected fields below it. 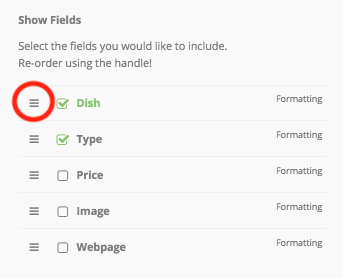 To reorder the fields, simply drag and drop them using the hamburger like icon to the left of the field name. You can format how this data looks in two ways. 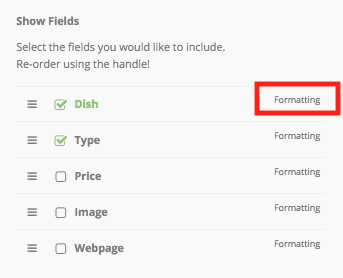 You can format how all of the data looks by using the 'Font Formatting' options and you can also pre-determine how specific data within this field looks by clicking the 'Formatting' option to the right of the field name. Font Formatting - Here you can choose basic formatting options such as, font type, colour, size, alignment and much more. You must select the field you wish to format before editing these settings. Formatting - Here you can pre-determine how specific data within this field looks. Once you have completed the formatting, click 'Save Changes' to be taken back to your zones playlist. If you are happy with your playlist and its settings, click 'Finish Editing Playlist'. You can then preview your layout with your data by clicking 'Save Changes' then choosing 'Save & preview'.